Rashmi Zimburg is a Certified Integrative Nutrition Health Coach and a specialist in Ayurvedic recipes. As a global citizen and a mother of two daughters, Rashmi is passionate about food as a source of healing and energy. In addition to growing up in India and the USA, Rashmi has accompanied her diplomat husband through various postings to Algeria, Indonesia, Austria, Japan and now Australia. Growing up surrounded by a large extended family where healthy and unprocessed food was the norm, eating according to Ayurvedic rules was second nature to her. Rashmi also studied food and Ayurveda extensively for more than a decade while navigating her life through each country and exploring the different food cultures. 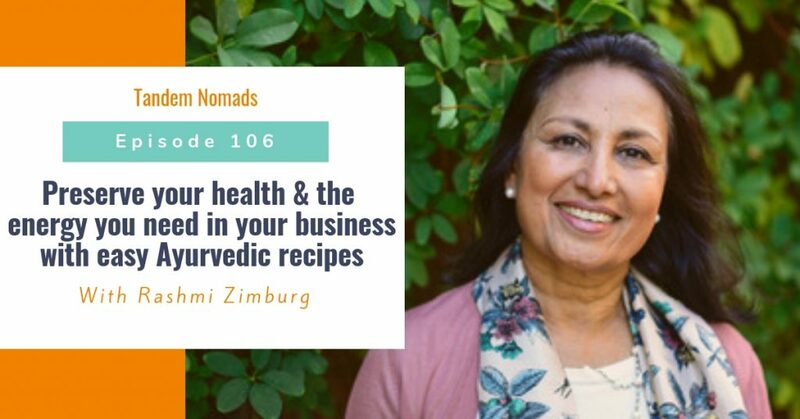 After a career in Finance and Cross Cultural Training, as a health coach Rashmi brought all her special skills and life experience together to guide people to living healthier using natural foods and ingredients. How Rashmi ended up specializing in Ayurvedic health and food. What do Ayurveda health and Ayurveda food mean? What are the 6 tastes of Ayurveda? The food combinations to avoid for a healthy diet. Some easy and healthy food routines to take even when we have a busy life. The important things to realize about eating and food for your body.